Hi Everyone, and welcome to another issue of "From the Battlefield". The live interview has spread, so now you can enjoy a live interview with DOCLOVE from HG in Army review. News has had a good reception with Mobile Game Review from QuinoaAOC and as always he does a fine job. With the coming of summer and all the real life activities, activities within TAW are affected as well. News will continue to gather as much information as we can to fill the newsletter. 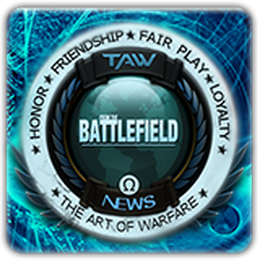 News wants to thank everyone who has made submissions for August, "From the Battlefield" simply can not exist without your time and efforts-Thank you one and all! As the sun starts to make its way up in the eastern sky of Oregon State. I am anticipating the beauty and the serenity of the North Umpqua River. I cant help but wondering what giant rainbow trout is waiting there just for me. The fresh brisk air strikes my face and the smell of the woods reminds me of other trips and other places. I must admit that I never grow tired of those smells and the excitement as I step into the river and wade to that special spot. Fly-fishing is an art they say, and to a certain degree I would agree with them. Most of us never achieve the status of a master, but then again most of us have no need to reach that status. We would rather rise to the point of being simply good. Then enjoying the places the art form takes us, and if we are lucky passing down the knowledge of the Angler. Many of the same lessons I have learned in Fly-fishing have crossed over into real life as well as my Time here in TAW. Fly-fishing has many unwritten rules and a code of conduct that simply is. Unlike TAW, none of these are written down, but rather they are passed down and learned from others. Never the less we are bound by them and at the end of the day we are better-off because of them. Fortunately in TAW these rules and codes have been written down and available for all to see, and what is just as important, a way to change them when they become antiquated. Learning the system and working within it's boundaries is essential to get things done. I cannot imagine going fly-fishing without being properly schooled in the do's and don'ts and lacking sufficient equipment to do the job right. When I look around TAW, I see all the tools needed to do the job, I see individuals from all cultures who know how to use these tools to keep TAW vibrant and dynamic. Frankly the variety of skill sets and the knowledge base here in TAW is astounding, in my opinion, it is a big part of why TAW is a premier Gaming community and why it still is alive. So if you feel there needs to be a change, step up, work within the system, utilize all the tools, tap into the knowledge base and roll up your sleeves. Because if a job is worth doing, its worth doing right.